Cataract Canyon lies in the heart of Canyonlands National Park 65 miles down the Colorado River from Moab, Utah and 110 miles down the Green River from the town of Green River, Utah. These two powerful rivers meet at the Confluence and combine to make some of the most commanding and famous rapids in North America. Cataract Canyon's rapids caused more damage and created more fear in early river runners than those of the Grand Canyon. Cataract's rapids are only part of the amazing story about this section of the Colorado River. Cataract and Canyonlands also has amazing human, and natural history, along with classical river running stories and adventures. Congress established Canyonlands National Park in 1964 after a long history of "potential" development in Cataract Canyon. Before 1921 the Colorado River was know as the Grand River. Congress changed the name under pressure from the state of Colorado in the Colorado Compact, which also designated water rights to the sates that border the Colorado River. The Rio Grande Railroad tried to build a railroad from Denver to LA following the Colorado River in 1889. In the early 1900's steamboats carried mining supplies, fruits, and cattle between Green River and Moab using the Colorado and Green Rivers. There was also an attempted dam site at the Confluence in the early 1900's. The amount of sediment at this location made it nearly impossible to build. 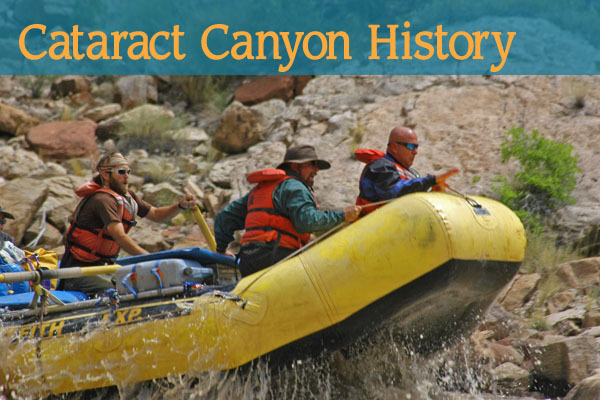 Read More about Cataract Canyon History.